We, Ultra Febtech Pvt. Ltd. company make different type of size reduction machineries like Flaker, Ultrafine Pulverizer, impact Pulverizer, ultrafine grinder, Pulverizer, ultrafine Pulveriser, Ball mill. Hammer mill, pin mill, flakes making system, Air classifier mill, ACM mill, Ultra Grinding Mill, UGM system, Air classifying mill, ultra grinding mill etc. A unique equipment to handle the mass that is most difficult to grind, It gives he desired fineness with a very high capacity and that too at lower power consumption. No special feeding systems such as screw conveyor or rotating valve is required it pulls the material in, due to high suction of air and throws in high vertical discharge pipeline makes even drying possible with in the same equipment. Less maintenance makes the operation of the grinder unstoppable. The equipment is available in vertically mounted or horizontally mounted on tough frame. Various capacities are available. An extra heavily constructed machine designed to pulverize even rocks and minerals of medium hardness. Fineness, ranging among 100 meshes to 500 mesh (150 to 30 microns) and in some cases even 500 meshes. Non-concrete foundation frame with AVM pads may be provided. The equipment is suitable for medium hard minerals, chemicals, bulk drugs, coal, paints, dyes and pigments, herbs, seed etc. 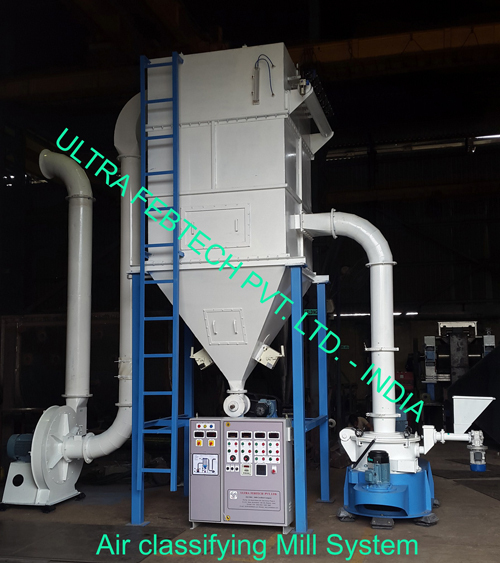 Some process needs only crushing of the material to meet either to requirement of coarse material or to feed smaller sized material to another grinder. Two hardened rolls rotate towards each other. They are kept nearer to each other by means of tether mechanical devices or with hydraulic system helps to create the pressure on the rolls and makes the crushing possible. The larger particle of mass, cereals, pulses is pushed between the rolls uniformly spread and with a continuous rate through a separate device. A dried feed mass gives material at the bottom with reduced size or if soaked cereals or pulses, give you the material in a flake form. A good range of batch type ball mills to crush even the hardest materials like quartz, topaz, ceramics, silica etc. different types & material of liners and grinding device is used such as hyper steel, stainless steel, Mild Steel, ceramic etc. may be selected to suit the requirement. The machine is designed for finer mesh grinding of different materials, which are heated during grinding. The RPM of machine is varying from 2000 to 5000 depending on the material to be pulverized. The output mesh size is also variable from material to material. This is an ideal solution for size reduction for foodstuff. It is available with water-cooling jacket on special requirements. Uniform output & easy to operate and maintain are the distinctive features of the mill. Application : pulses, dyes, chemicals and many others. Hammer mill is used for the materials that are grounded on the impact of the hammer. The feed is at the top and while rotating in the grinding shell; it is often allied beaten by the swing type hammers fixed to the rotor. It is crushed by frequent contact of hammers and wall. A screen is round the rotor, which prevents the bigger particles to escape from the chamber. 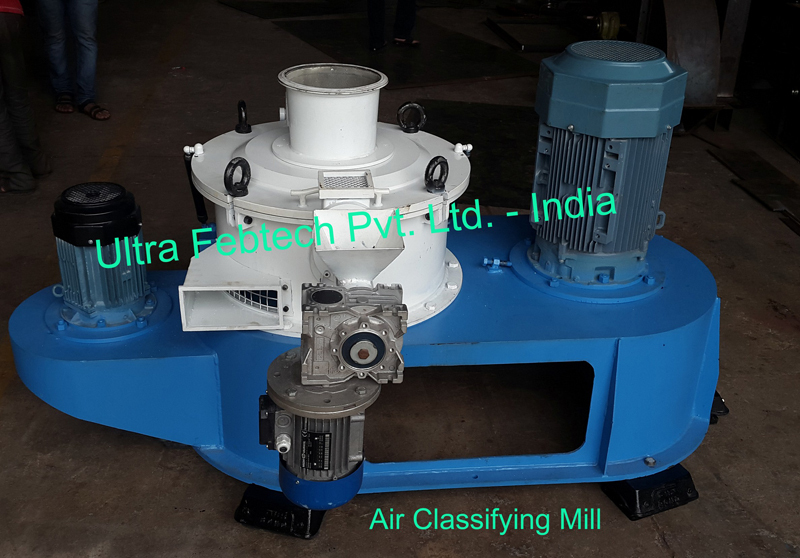 The mill is made in SS and MS.
Air Classifier Mill is used for size reduction in desired particle size. The air classifying mill is screen less. The system consists classifier where the fine particles of desired size are segregated. We have established a note worthy status among the Ultra Air Classifying Mill Manufacturers in India. We bring for the clients Air Classifying Mill of exceptional quality at cost-effective price. Application : ACM Mill system Used for Limestone, Clays, Metallurgical Powders, Aluminium Oxide, Graphite, Calcined Magnetite, Pigments, Silica, Hydrated lime, Food Products, sugar, psyllium, tamarind kernel (TKP), cassia tora, spices, Chemicals etc..